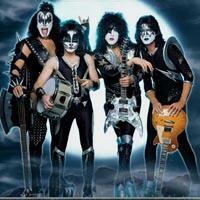 Kiss is an American rock band that began in 1972 in New York City. The band's trademark is the members" use of face paint to imitate horror and comic book characters, as well as their extravagant stage performances which includes spitting blood, fire breathing, smoking guitars, and pyrotechnics. Kiss was extremely popular in the 70s, selling over 80 million records worldwide. The original band lineup consisted of Gene Summons (vocals and bass guitar), Paul Stanley (rhythm guitar and vocals), Ace Frehley (lead guitar and vocals), and Peter Criss (drummer and vocals). Vote for your favorite Kiss albums.